In healthcare EDI, there are several transaction types. The following transactions, included in the 5010 version of HIPAA-mandated healthcare ASC X12 transactions, are used most frequently in the dental industry. Through the collaboration of our members, NDEDIC works to standardize data sets and implementation guidelines that will maximize the value of the transactions for dental. ASC X12 270: Eligibility, Coverage or Benefit Inquiry. Allows providers to check whether a patient has insurance coverage, as of a specific date. ASC X12 271: Eligibility, Coverage or Benefit Information. A response to an eligibility inquiry stating whether patient has coverage and often providing additional information on patient benefits. NDEDIC is making great strides in promoting effective use of these eligibility transactions within the dental industry. ASC X12 277CA: Health Care Claim Acknowledgment. Generated by an insurance company or clearinghouse to return information about the delivery or processing of a claim to the provider in a standardized electronic format. The ASC X12 277CA transaction is created without the need for the provider to request information using an ASC X12 276 Claim Status Inquiry. Today, many insurance companies respond to claims using their own report formats and/or electronic transaction formats. The ASC X12 277CA offers a common interface to the insurance company and the provider, thus standardizing the response. Because a claim may progress through several different statuses before reaching a final processing disposition, a provider may receive multiple ASC X12 277CA transactions for a single claim. ASC X12 835: Health Care Claim Payment/ Advice. Created and sent by insurance companies to providers. The transaction contains payment and adjudication information for multiple claims or predeterminations from an insurance company to a single payee (provider). The ASC X12 835 transactions are typically used when a provider uses EFT (Electronic Funds Transfer) as a means of payment from the insurance company. NDEDIC is working to make the ASC X12 835 transaction more uniform and useful for the dental industry. ASC X12 837: Health Care Claim Transaction. Request for payment from a provider to an insurance company or a statement of the proposed services sent as a predetermination. This transaction can also be used to report encounter information. There are three types of claims: dental claims, medical claims, and hospitals claims, with each type of claim warranting its own transaction. The dental claim is referred to as the ASC X12 Health Care Claim: Dental (837D). Claims may be sent either in batches or individually. Individual claims usually are sent only when requesting Real Time Adjudication (RTA). ASC X12 999: Functional Acknowledgement. Serves as a receipt for an ASC X12 837 claim or encounter file or the contents of an ASC X12 837 claim or encounter file, and offers information on the validity of the data content and syntax of the transaction. The ASC X12 999 is a superset of the ASC X12 997 Functional Acknowledgement transaction that was part of the first version (4010A1) of HIPAA-mandated X12 transactions for healthcare. The ASCX 12 997 is now obsolete. 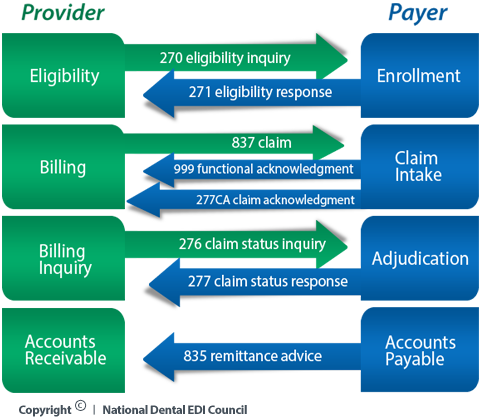 The following graphic illustrates the life cycle of a claim or encounter transaction. Download a more complete list of EDI transactions, including those not widely used and/or superceded by more current transactions. Learn more about the ASC X12 837 Health Care Claim Transaction, the benefit of filing electronically, and how to use the transaction.